Mike Colwell has been mentoring startup founders for over a decade in his role with Square One DSM in Des Moines, Iowa. He’s also on the board of directors of two accelerators focused on sectors where the region is building on established strengths: one for startups in the insurance sector and the other focused on agritech. 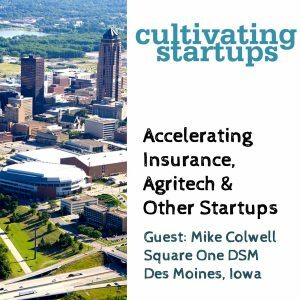 On this week’s show, Mike talks about how the accelerators were created and structured, how they’re funded, how they operate, lessons learned from an earlier unsuccessful incubator, and the growth of the Des Moines startup ecosystem. Press play to listen or subscribe with your favourite podcast app. Ep 25: Do tech incubators make sense in small urban areas? Yesterday the Ontario government says "Ontario’s postsecondary institutions conduct high-quality research through campus accelerators and incubators" and today we hear they've picked Jim Balsillie to chair a panel reviewing the innovation ecosystem. Which shows more cluelessness? Ontario Budget: "Ontario’s postsecondary institutions conduct high-quality research through campus accelerators and incubators"
Good to see that they have a strong grasp of the innovation ecosystem.